This is part of my Photography HOWTO series. To start off I will be looking at the basics of lens controls, what they do and how to use them. The first thing we need to understand is how a pinhole camera achieves a sharp image, or more precisely, how the size of the hole affects the image. 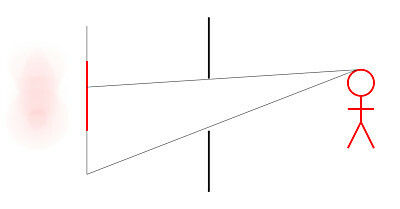 If we take a point on the subject, the light going through the perfect (infinitely small) pin hole will result in a corresponding point (mirrored) on the screen. If we make the pin hole a little bigger, the light from the point now spreads out over a small area. This area is called the Circle of Confusion (COC from now), but more about this in a moment. The effect is the image is a bit blurry now. Now if we make the pin hole really big, the light spreads over a larger area (we increased the COC) again and the image is just a blurry blob. 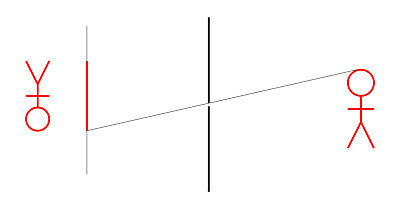 The effect of each point spreading through the pinhole is that it merges with the light from adjacent points and blurs the image. So the larger the COC, the more blurry the image. This is a fundamental thing to understand, and one that we will come back to shortly. The smaller the pin hole (or aperture), the smaller the COC, and the sharper the image. As the pin hole (or aperture) grows in size, so does the COC, and the more blurry the image. But we can cheat! An ideal lens allows us to focus one point, onto another point on other side of the lens. The key question is what happens to things that are not on the point of focus? They get blurry of course! If we combine the pin hole camera with a lens, an interesting thing happens: the pin hole acts in a similar way on the parts of the image that the lens is not focusing on. And the same rule applies: The smaller the pin hole (or aperture), the smaller the COC, and the sharper the image away from the point of focus. As the pin hole (or aperture) grows in size, so does the COC, and the more blurry the image away from the point of focus gets. There we have the fundamental principal behind the typical camera lens - it is a lens combined with a pin hole (or aperture). 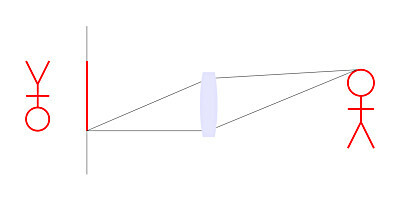 The aperture is measured in terms of an F number. Say F/8 or F/32 - what that means in pin hole terms is that the diameter of the pin hole is 1/8 of the focal length, or 1/32 of the focal length respectively. The important thing to understand is that as the F number increases, the effective pin hole is a smaller fraction of the focal length in size. For example, if we have a focal length of 100mm and an aperture of F/4, the effective pin hole diameter is 100mm/4 = 25mm. So, if we want a photo that is sharp from the foreground to the horizon, we need a small aperture (pin hole) which will mean a large F number like F/16, and, if we want to have everything behind our point of focus blurred (eg. picking out one person in a crowd), then we need a large aperture which will mean a small F number like F/2.8. The area either side of the point of focus which is acceptably sharp is called the Depth of Field, or DOF for short. A longer (larger number) focal length will mean that we get more magnification from it, so it makes things far away big enough to fit in our photo, or gives a telephoto effect. The shorter (smaller number) focal length will mean that we get less magnification from it, so it takes squashes much more of the scene into our photo, or gives a wide angle effect. 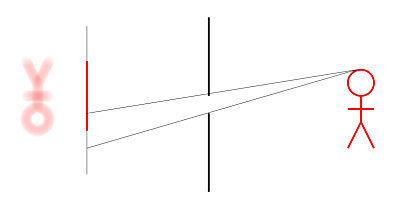 Combined with an aperture, the other effect that focal length has opposite: the longer the focal length, the less DOF (ie. the photo blurs out quickly either side of the point we have focused on), and the wider the lens, the more DOF (ie. the photo stays sharp longer either side of the point we have focused on). This is useful: for landscapes we would have a wide lens to show a large scene, and we want the whole photo in sharp focus, and as if by magic, a wide lens helps us get that. Likewise, for a portrait where we want to pick a person out of the background, the telephoto lens naturally helps us do that. Aside from controlling blur, the other thing that an aperture affects is the amount of light passing through it. Naturally, the larger the hole (aperture), the more light passes through, and the smaller the hole (aperture), the less light passes through. The important thing to understand here is that the amount of light that gets through is related to the open area of the aperture. From basic school maths, we know that the area of a circle is related to the square of it's diameter. An easy way to think of this is that if we reduce the width of a circle, we also reduce the height - so we get a double effect. So if we halve the diameter of the aperture (say go from F/4 to F/8), we quarter the open area, hence a quarter of the light passes. Halve the height of the circle, then halve the width to get a quarter of the area. Likewise, if we double the diameter of the aperture (say go from F/4 to F/2), we quadruple the open area, hence four times the light passes. Think about that - it is important to understand it clearly before moving on. Every time we multiply the diameter of the circle by approximately 1.4 or 0.7 then we change the area by a factor of 2 up or down, and hence the amount of light by a factor of 2 as well. We call this "a stop" - a change in the amount of light by a factor of 2: half (stop down) or double (stop up). Very important! Take time to understand it. Take your time and understand this - it is very important when we move on to the next article: Exposure. Light and lenses follow some fairly straight forward physics, which means that with a bit of maths, we can calculate what is going to happen, or better yet, we can calculate how to get the most out of the lens. 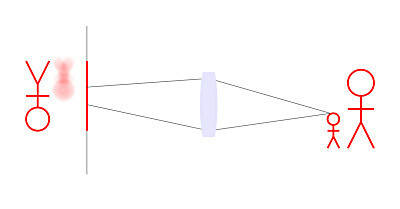 The most useful mathematical lens optimisation is called Hyperfocal Focusing. The idea is that we can calculate a way of setting up a lens to give the maximum Depth of Field (DOF - the area either side of the point of focus that is acceptably sharp). This is very useful for photographing scenes (like landscapes) where we want everything from the foreground to the horizon in sharp focus. Carrying round a calculator to work out how to set up your lens would be tedious, but having a simple table of settings to print out (I laminated my one) and keep with the camera is just the business. I have created a simple spreadsheet that you are welcome to use for your own use: Hyperfocal Chart in OpenOffice.org Format, or Hyperfocal Chart in MS Excel Format. To use this with your camera / lens you need to understand something first. The chart needs to be altered to match your camera sensor if you want to optimise the settings for the absolute best you can do. The default settings should be ok for small prints (eg. 6x4") with typical consumer dSLRs from manufacturers like Canon or Nikon which use an APS-C size sensor. If you have something else (eg. a compact, full frame, or others) or want to get the most out your camera and be able to print your pictures BIG, then you need to gather some information and change things. The vital bit of information is the pixel pitch (distance from centre to centre of adjacent pixels) for your camera's sensor. This can often be found on the net with a bit of searching, and some sites like this one (see just below half way down the page) have a table with useful information. This figure should be in micron ("µm" sometimes written "um") - simply put the number into the place marked "Pixel Pitch" in the spreadsheet. If you want to allow for some compromise in image quality, putting in double the number is often a good place to start from. This number represents the amount of blurring that we are going to accept. Next, find out the range of focal lengths (in mm) your lens can do and replace the row across the top of the table (currently 10 through 70) with a set of convenient steps in this range. There is little point in going far into the telephoto range for this as telephoto lenses do not produce practical Hyperfocal distances. Next, look at the F number range your lens can cover. Typically this may be F/2.8 to F22. This is not the maximum aperture number that often varies on cheaper lenses over the range of zoom (eg. F/4 to F/5.6), but the actual maximum and minimum you can set the lens to. This can be checked by putting the lens on the camera and seeing what range of F numbers the camera allows with that lens. Set the numbers in convenient steps (say 1 or 2 stops) and put these down the left side if the defaults are not suitable. The chart is now ready for use. Compose your image, and take note of the focal length (or guess it). Work out a good suitable exposure (see next article). Remember, we probably want to stop down a reasonable amount to get plenty of DOF. Take note of the F number. Look up the F number on the left row of the chart and follow the row across. Look up the focal length on the top row of the chart and follow it down to where it crosses the F number row. That number is the Hyperfocal Distance. Focus the lens at that distance, either manually, or by using auto focus on an object at that distance. Like this, when you take the photo, everything from half the Hyperfocal Distance to the horizon will be in acceptably sharp focus. Now, logic would have it that the more you stop down (bigger F number), the sharper everything in the image gets.... and if only it was that simple! 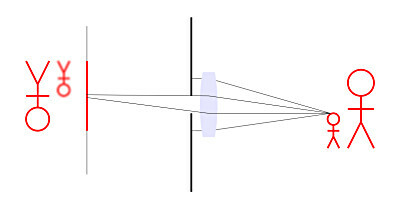 The trouble is something called diffraction that happens on the edges of object blocking light - like the aperture. Without getting technical, what diffraction does is scatter the light, effectively blurring the image. As we stop down (make the F number bigger and the aperture smaller), we let through less direct light relative too the light diffracted (scattered) off the edges of the aperture. This makes the overall sharpness worse..... that is assuming a hypothetical perfect lens. With real lenses it gets a bit more tricky, and this is where knowing your lens helps. 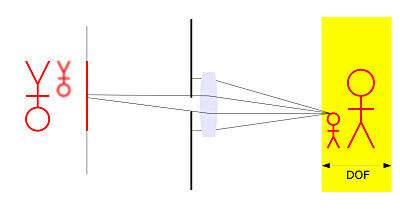 With a budget consumer lens (typically costing up to a few hundred £), and especially in the ones given away in entry level dSLR kits, the defects in the lens are so great that it will often take stepping down to F/16 or F/22 before the diffraction becomes bad enough to see above the existing lens defects. Be careful - when stopped down so much there is also a risk of loosing more quality through not being able to hold the camera still enough for a sharp photo - see the next article. On the other end of the spectrum, I have a professional prime that is so sharp that by F/5.6 the tiny effects of diffraction are starting to become visible. The thing to understand is that just blindly stopping down further won't always make things sharper. With a top quality pro lens it is often worth seeing if you can live with a bit less DOF and open up the aperture to take advantage of the performance of the lens, where with a cheapie lens it may be worth stopping down a bit more than you need and reducing the effect of defects in the lens.